FoodARC hosts and supports diverse events to share research results, have meaningful conversations, and support learning. For more information about past events, including descriptions and any associated resources, please click on the event title below. On May 17th, 2018 FoodARC proudly hosted The Community-Campus Engagement Canada – Halifax Roundtable. The event was led by the principal investigator of The Community First: Impacts of Community Engagement (CFICE) research project, Dr. Peter Andrée (Carleton University). CFICE is a 7-year action research project that is focused on strengthening Canadian communities by improving community-campus partnerships. The CCEC Halifax Roundtable is a part of the series of events hosted all over Canada with the intention of gathering a valuable input from the community-campus engagement (CCE) stakeholders. The Roundtable started with welcome remarks by Dr. Patty Williams (FoodARC, Mount Saint Vincent University), discussion of expectation and goals, followed by an introduction of participants. After that, Dr. Andrée provided an overview of the CFICE project, insights from the CFICE symposium and answered questions about food policy, partnerships with provincial governments and integrated learning experiences for students. Dr. Andrée’s presentation was followed by a story sharing activity where participants partnered up and discussed their experiences in CCE. Participants were asked to outline the values and challenges of the experiences and bring them to the whole group. Some of the values included: adaptation, collaboration, sharing work, listening to communities, having fun and professional training. The challenges brought up by participants included: institutional constraints, tired communities, funding, pace and purpose (misalignment of community and academia), power struggles, matching skills and needs, student only-oriented experiences, time struggles, continuity (with the cycle of students), decolonization (value of two-eyed seeing as a research tool), challenges in engaging with Indigenous communities (ethics, power, ownership of the results, research through the intersectionality lens). After the story sharing activity, participants were divided into small groups to complete the SOAR exercise that was focused on future visions and actions in CCE. Some of the recommendations developed by the participants included: utilization of positive international and national experience, a creation of shared language understood by everyone involved, transdisciplinary approach beyond the partnerships between communities and academia, leadership from “in-between”, advocacy on the federal level, a value of social capital and common fundamental purpose. View a full compilation of the notes from the event. For more information on CFICE visit their website. On May 30th, 2018 Felicia Newell will be defending her Master’s thesis for the degree program MSc (Applied Human Nutrition) at FoodARC. Felicia’s thesis title is “How and why do social ideologies, discourses and stigma at the institutional level contribute to the ongoing food insecurity and marginalization of low-income lone mothers in Halifax Regional Municipality. This event is open to the Mount community and the public. We will be glad to see you there! Community-Based Research Canada presents a free webinar series called “Exploring why community-based research is an important mechanism for societal change”. This series includes three parts that look into the impact of community-based research from different angles: the Canadian context, an international perspective, as well as the path towards the UN Sustainable Development Goals. A report released a few months ago, Maximizing the Capacities of Advanced Education Institutions to Build Social Infrastructure for Canadian Communities, highlights the role that our universities and other post-secondary institutions can, and should, play in addressing the challenges and uncertainties that threaten social cohesion and community well-being in Canada and beyond. The report points to existing institutional assets and capacities, which, when directed at building social infrastructure, can make a real positive difference for our communities and their citizens. In many respects, the report echoes the strategic priorities and operational plans of many of our universities and colleges. Yet the potential for collaborative initiatives and action still substantially exceed what has so far been realized. This is the positive and evolving context and trajectory in which pan-Canadian organizations, like Community Based Research Canada (CBRC), see their mission and objectives. In this webinar, Stephen Dooley (SFU and CBRC Board) and Martin Taylor (CBRC Board Chair) describe the role that CBRC plays as an enabling platform and forum for sharing and disseminating best practices, supporting collaborative research initiatives, liaising with funding agencies, and promoting excellence in community based research. The discussion will draw on some specific place based examples of community based research projects. The first webinar is on June 5th, 2018. Registration is now open through CBRC’s website. Growing procurement of fresh, healthy, locally produced, sustainable food in our schools, universities, health care facilities, and day cares in Nova Scotia, builds healthy communities with healthy local economies. How can we support each other in the work we are already doing and plant new seeds for big ideas and further impact? Mount Saint Vincent University hosted an interactive workshop connecting over 70 participants from various sectors across Nova Scotia, allowing them to share and learn from each others stories about the strategies and challenges they’ve faced in the journey of procuring fresh, healthy, locally produced and sustainable foods within institutions. The Harvest Report includes the shared stories and key themes discussed in and around these stories, as well as steps moving forward. The Harvest Report is an important read for anyone facing challenges in ensuring their institutional procurement practices are centred around sustainability and wellness for the community as a whole. Click the link below for access! The Harvest Report is the outcome of the interactive workshop and is a documentation of success stories, current strategies, and a list of next steps. On March 2nd, the Food Action Research Centre (FoodARC) shared its most recent report on whether Nova Scotians can afford to eat healthy at an event hosted at the Dartmouth North Community Food Centre. Since 2002, FoodARC and its partners have carried out participatory food costing every few years to examine the question: Can Nova Scotians with low incomes afford to eat a healthy diet? This question is important because we have seen increasing food insecurity across Canada, and because Nova Scotia has the highest rate of food insecurity of all Canadian provinces. Participatory food costing is unique in that people with experience of food insecurity (primarily women) participate in all aspects of the research process, including doing training and collecting data on access to a basic nutritious diet in grocery stores across Nova Scotia. The FoodARC team would like to say thank you to all those who came out this morning to the launch of the 2015 Report on Participatory Food Costing. Special thanks to the Dartmouth North Community Food Centre, Catherine Martin, Deirdre Lee, and Corrie Melanson for their enormous contributions to today’s event. Find this report and previous Food Costing reports in our projects section. Corrie Melanson created life-size family models for the event. The models communicate stories of families’ ability to eat healthy. The launch of our 2015 Participatory Food Costing report was an engaging and interactive event where we shared our key research findings, and the impacts of two policy levers in addition to a set of recommendations that build upon our previous work. At the heart of it, the release of the 2015 Report on Participatory Food Costing in Nova Scotia was for those who want to create a sense of possibility for shifts in policy to support healthy, just, and sustainable food systems for all. We wanted to share what we heard back with you, those who attended and anyone else interested. Social media also played a role in the event, so we ‘storified’ the event, which we would love for you to check out and share. Co-hosted by: Facilitator Corrie Melanson of See Meaning and Catherine Hart a FoodARC Research Associate. This regional gathering and conversation was hosted as part of the outreach project “Looking Back to Move Ahead,” which is funded by the Social Sciences and Humanities Research Council and is being led by FoodARC and some of its partners. The event’s twenty attendees introduced themselves with help from a meaningful photograph they selected upon arrival. Community members spoke energetically about where they were from, the role that food plays in their life, why they came, and what connected them to the particular photo they chose. Catherine Hart introduced the Food Action Research Centre and shared the findings of the most recent cycle of Participatory Food Costing in Nova Scotia. The research is published in “ Can Nova Scotians Afford to Eat Healthy? Participants had paired conversations, guided by questions. Attendees moved into groups to distill highlights, connections, and new insights. We greatly appreciate the hospitality and catering by the Women’s Institute and we felt fortunate to work in a space like the Sable River Community Hall for this gathering. On Saturday, June 10th, over thirty residents of Kings County joined together in conversation to take action on community food security. The event’ was organized by Duncan Ebata, The Spot Community Food Hub and Barry Leslie, Mud Creek Rotary Club. The event was facilitated and graphic recorded by Anne Stieger and Corrie Melanson. The activities and conversations of the day took participants through a process of discovering, dreaming, designing, and action planning for new and existing projects in Kings County. The day provided space for pitching projects and ideas, time to discuss them in small groups and mind-space to depart with clear action plans. Four event participants also played the role of storyteller during this morning activity. Attendees were invited to listen to one of four separate stories. Participants paired up and had conversations that were guided by three questions. Participants were asked to dream big and imagine their preferred food- related future in small groups. Participants shared the components of their visions for empowering food for all in Kings with the larger group. Their responses were sorted into themes shared between and across group. This final and crucial chunk of time is what everyone had been working towards throughout the day. Individuals involved with an existing project or bringing a new idea to the table were invited to host a conversation and action planning session about their project. Seven projects were brought forward; the conversations and progress was captured on visual templates and presented briefly to the larger group at the end of the session. The Ecology Action Centre and FoodARC partnered with the Nova Scotia Departments of Agriculture and Health and Wellness to host an event on institutional procurement of healthy, just and sustainable foods in Nova Scotia at Mount Saint Vincent University in Halifax. Nova Scotia’s institutions feed large numbers of people every day. Universities, schools, and health care facilities, among others, play a key role in nurturing local and sustainable food systems that support wellness and community economic development in our province. At this workshop, Joshna Maharaj, Chef and Activist, shared her multifaceted experience in shifting institutional food practices, procurement and public dollars to focus on healthy, local and sustainable food. Following the talk and lunch, those actively engaged in growing institutional procurement of healthy, local and sustainable food in Nova Scotia were invited to a special workshop to be mentored by Joshna and to learn from colleagues across the province. If you weren’t able to attend or wish to revisit or share the workshop content, watch the video of the morning portion, including Joshna Maharaj’s presentation and local stories. We have created a Facebook group for you to share updates about what’s happening regarding the institutional procurement of healthy, local, and sustainable food in Nova Scotia. Join the Facebook group to connect with others who are interested in making change. During the workshop, participants were invited to share their thoughts on Twitter using #NSfoodshift. To view this discussion, visit Twitter and search #NSfoodshift. To build on the success of the presentation and workshop, we want to know what you thought of the event. If you attended the workshop, fill out this 3-minute evaluation survey to help inform and improve our efforts moving forward. Dr. Patty Williams presented ‘The Hand You’re Dealt‘ at the Food Secure Canada 9th National Assembly: Resetting the Table, for the stream session Food Security: Towards Zero Hunger. Resetting the Table featured 50+ sessions to build skills, learn from experts, exchange views and develop our strategy to improve our food system. Resetting the Table offered a rich program of plenaries, networking meetings and more than 60 sessions spread out over 10 thematic streams. Since 2002, the Food Action Research Centre (FoodARC) has been examining the affordability of a nutritious diet in Nova Scotia using Participatory Food Costing. FoodARC developed a board game called The Hand You’re Dealt to communicate our findings and focus responsibility for food security on policy-based solutions. The game has been played with family resource centres, food activists, student groups, high school classrooms, and health professionals, and has proven to be an incredible way to create empathy and challenge judgements about people facing food insecurity. In this workshop, you’ll play the game and discuss what it teaches us about how to communicate about food access in a way that captures people’s attention and transforms their perceptions. You’ll also try out some supplementary tools for facilitating group game play and debrief, and talk about how you might use scenario-based pedagogical and communication strategies in your own work. Last Thursday Janurary 15th, Nova Scotia Youth and Food hosted their first Networking event at FoodARC. Many members of the Meal Exchange chapter on campus at MSVU received funding or bursaries to attend the Food Secure Canada Assembly in Halifax in November 2014. Some students shared back their experiences with other members of the chapter through photographs. Landon Brown, an student in the Nutrition Program at MSVU had the opportunity to volunteer and take notes at some interesting sessions at the Assembly, including a session on local and sustainable fish. He took this photograph at the Atlantic Superstore on Barrington Street, and was quite surprised how knowledgeable the staff selling the fish were! Laura Pugsley, also a student in the Nutrition program at MSVU was sponsored at attend the Assembly by FoodARC and MSVU. She found that she’s began to have a better understanding of conservation and land issues in relation to food sovereignty. She found a session hosted by ACORN (Atlantic Canada Organic Regional Network) on barriers to land access particularly interesting, and snapped this photo above Saskatchewan to illustrate how she has begun to look at how we use our land, from a plane. Gillian Bennett who is also a nutrition student at MSVU, was sponsored by FoodARC and MSVU to attend the Assembly. She found the session “The ABCs of GMOs” particularly interesting, because she had gone into the session not knowing too much about genetically modified organisms. She now keeps this handy little info guide about GM foods on her fridge to help her make decisions about which foods to avoid! Katie Cvitkovitch who is a nutrition student at MSVU and an Research Assistant at FoodARC received a bursary from Food Secure Canada to attend the Assembly. After the Assembly, she began thinking about what her role can be in the food movement after she graduates this year. The photo she chose is from a Meal Exchange event hosted by USC Canada, because that event in particular made her start thinking about all the inspiring work going on the Food Movement! Justin Cantafio, the Sustainable Fisheries Campaigner at the Ecology Action Centre was particularly excited about getting local and sustainable fish on university campuses in Halifax. We are hoping at MSVU to work with our campus Foodservice provider this semester to make this dream a reality! Other conversations about international student food insecurity, fishing, and the how surprised we were about the amount of people who attended the Assembly (~500 attendees!!) were also interesting conversations that were had at this session. On March 20th, Meal Exchange MSVU, in collaboration with the Mount’s Community Garden Society, hosted the Our Food System Panel. We had a great turn-out and we are excited to share some of the main learning points from the event! A lot of great information was shared and a great discussion was had. An interesting point that was made by Jamie Tingley was that farming isn’t often glamourized or looked at as a good career move. Parents aren’t exactly encouraging their children to farm when they grow up. This is unfortunate, as many farmers are aging and there is an important need for young farmers! It was exciting to see a couple of younger farmers on this panel, who are doing really great things in agriculture. Something that was discussed at length was the hardship of farming. Patricia Bishop spoke of the fact that despite the fact that she and her husband have been farming at Taproot for about a decade, they still can’t really afford to take much time off. Farming is a big job, especially when you’re running a small scale farm with very few staff. You don’t often get to take time off, and you’re getting up early and going to bed late most days. It definitely isn’t a job for the faint of heart. I don’t think that it means that you should cross farming off your list as a potential career, it just means you need to be sure that this is what you want to devote your life to when you get into the business. The concept of “voting with your fork” was also raised. I think it’s important to acknowledge that we all eat at least 3 times a day, and what we choose to buy and consume can influence what is available. If consumers are demanding local, healthy food, then hopefully the market will respond by providing more of this kind of food! People shouldn’t underestimate the power that their voice and their dollar has. This was something that Phil Keddy talked about – if his sweet potatoes are next to some sweet potatoes from the US in the grocery store, and everyone buys his sweet potatoes, then the grocery store will respond by sourcing more sweet potatoes from him. This is good for his business, on an individual level, and good for the local economy as a whole. So how can students get involved with this local food movement? The purpose of the workshop series was to get better at telling food stories, so that more resources and efforts mobilize towards healthy, just and sustainable food systems. The two-part workshop helped build our capacity to communicate effectively using community dialogues, traditional media, and social media. At Session I we developed fluency with food security messaging in order to reach communities, policy makers and governments at all levels. We also explored an approach to “prototyping” (rapid experimental discovery through doing) and identified prototype projects (innovative approaches aimed at growing the conversation about food security in Nova Scotia) using the Make Food Matter toolkit and messages. The focus of Session II was to reflect on the experiences of teams who had worked on a prototyping project over the summer and draw conclusions and lessons learned about the key elements of effective messaging and prototyping around food security issues. Nova Scotia food researchers and practitioners traveled to Manchester, UK, in August 2015 for the Fifth International Critical Dietetics Conference. Participants shared some of the resources from the conference that they found most interesting and valuable. The 30 minute talk covers the basics of the food system, the various actors operating in it, the changing world and key trends, the varying tools for control used, food policy and practice. In this talk, Liz Dowler looks beyond a narrowly scientific, reductionist approach to food, nutrition and health to the bigger picture of what makes for healthy people and communities and the role food plays in this. This report presents the findings of the Food Ethics Council’s Food and Fairness Inquiry, which was set up in order to remedy the relative neglect of social justice in public debate about food policy. It reveals the extent of social injustice in the food system within the UK and at global level, and demonstrates how this unfairness impedes progress towards sustainable food and farming. The report presents findings from a two year study involving interviews and roundtables with a wide range of people from across the food system. It highlights the top priorities for government and business action in pursuit of a sustainable food system. This article looks beyond the physical sciences to address the problems of hunger, malnutrition, and environmental degradation. It discusses the challenges and problems with global food security and where and why paradigm shifts are needed to meet those challenges in a fair and sustainable way. It discusses food’s role as a satisfier of human need, the importance of history in aiding the understanding of contemporary challenges and the fundamental changes needed to achieve the goal of fair and sustainable food systems. Facing Our Own Discrimination: What role does food play in healthy communities? Join us for an informal evening of information and conversation on the role food plays in building healthy communities, the daily challenges people face, and opportunities for positive change. Co-hosted: Chebucto Connections, St. Paul’s Family Resources and Food Action Research Centre (FoodARC). Co-presenters: Marjorie Willison – Chebucto Connections, Sara Kirk – Dalhousie University, and Meaghan Sim – Dalhousie University. Refreshments and a sampling of local food will be available. If you need childcare, then please inquire before February 17, 2014. An interactive Workshop to help sharpen your policy skills. This was an exciting opportunity for advocates, practitioners and volunteers at the community level to access information and tools to better understand and influence policy. The one-day workshop aimed to demystify policy, share stories from the field, integrate local level research and offer practical tools for mapping policies, planning campaigns and local action. Participants were invited to propose a policy issue that the group could use as a real life example for the hands-on portion of the day. An essential component of the workshop was to give participants the opportunity to work in groups to integrate their learning and use the tools presented to address a real-life policy issue. Influencing policy is a key part of FoodARC and its partners’ work. When trying to influence policy, it is important to understand the full context of the issue. This Policy Mapping Activity document is a useful resource to guide this process. A presentation of highlights from the 2012 Participatory Food Costing Report and a discussion on the recommendations. Presenters Chris Stothart of FoodARC and Stella Lord of the Community Society to End Poverty – Nova Scotia lead the discussion and reviewed highlights and recommendations from the report. Join us as we explore food security in our community informed by research completed over the past year by the ACT for Community Food Security team. Lend your voice, have great conversation and enjoy local food. Bring a photo that represents what a culture of healthy, local food looks like to you and add it to out ‘dream wall’. What role does food play in a healthy Pictou County? Co-hosted: Pictou County Food Security Coalition and Food Action Research Centre (FoodARC). Co-presenters: Lindsay Corbin – Pictou County Food Security Coalition, Sara Kirk – Dalhousie University and Meaghan Sim – Dalhousie University. Refreshments and a sampling of local food will be available. Onsite childcare available. MSVU Meal Exchange Chapter participates in a Virtual Classroom with David Suzuki, J.B. MacKinnon and more! Some really interesting conversations were had about food justice, and how we can work together to achieve food security in Canada. J.B. MacKinnon also made a really interesting comment that when people ask about his 100-Mile Diet, which meant he and his partner and co-author Alisa Smith only consumed local foods for one year, people always assumed it was hard and they were making sacrifices. He confidently stated otherwise, and boasted about the delicious and fresh food they “survived” on! There were also a lot of interesting questions asked about the current state of farming, and whether the panelists believe it is possible to ever go back to small-scale community farming. David Suzuki commented that he believes it is absolutely possible, and the way that we are producing our food right now is not conventional, or sustainable. Other members of Meal Exchange commented on what they learned from the webinar below. Comments from the virtual classroom session, Our Food Systems: Are you Hungry for Change? A big thank you to FoodARC for hosting Meal Exchange for this amazing, informative session! FoodARC is pleased to invite you to the celebration and release of Making Food Matter: Strategies for Activating Change Together (A participatory research report on community food security in Nova Scotia). This report is the result of the dedication and passion of hundreds of individuals over the past five years in communities, universities, and organizations across Nova Scotia and Canada to amplifying and broadening conversation, research, and action to strengthen community food security in Nova Scotia and beyond. Close to 100 project partners & community members joined us November 6th for the release of the most comprehensive report on community food security in Nova Scotia ever produced. The participatory research report emphasizes the complexity of community food security in Nova Scotia, notes its many influences, and provides a platform for action. And while the challenges are complex, the strategies to address problems of food security at the community-level are emerging. Nova Scotia is poised to be a leader in creating healthy, just and sustainable food systems. Nearly 500 food leaders from across Canada converged in Halifax November 13-16th, 2014 for Waves of Change: Sustainable Food for All, Food Secure Canada’s eighth National Assembly. Farmers, fishers, dietitians, policy makers, activists, entrepreneurs, community organizers, indigenous leaders, students, academics and more created three jam-packed days of programming, networking opportunities, and learning sessions. This is the first time the Food Secure Canada Assembly was held in Atlantic Canada and this edition featured the top experts from the region as well as across the country with a special focus on fisheries. For photos and videos, session notes, and the 2014 Assembly report, please visit Food Secure Canada’s website. Food insecurity was a recurring theme throughout the conference, with topics ranging from saving diverse seeds, to recovering traditional indigenous knowledge, to the transformation of food banks and the adoption of advocacy strategies to keep these issues on the government agenda. Over 4 million Canadians live in food insecure households, and the problem is also growing worse internationally. In this section, you will find examples of work that seeks to diminish food insecurity through community involvement, and usher in policies that support food sovereignty. The Assembly is co-organized by Food Secure Canada and FoodARC at Mount Saint Vincent University, in collaboration with the Nova Scotia Food Security Network and ACORN (which held its 15th conference in the same location). How do we reconcile the true costs of food (social, environmental & economic) with affordable price? Come join us on Tuesday, March 12th from 1-3pm at the FoodARC (2 Melody Drive, on the MSVU campus) as we explore this dynamic food security issue. The purpose of the gathering is to connect, foster relationships and have a great discussion about an important issue where community, human needs, the environment and the economy intersect around food. We are seeking a diversity of experiences and perspectives to create the most meaningful dialogue. Space is limited; please RSVP to nsfoodsecurity@gmail.com by March 7th. Kindly see and circulate the flyer for more information. Miranda Cobb will be hosting the gathering based on her project with the Graduate Diploma in Social Innovation for Food Systems at Waterloo University. This event is supported through the Nova Scotia Food Security Network. The local results from this research both sparked and continued meaningful conversations around the issues and responses to food insecurity in Nova Scotia. The Global Health Office of Dalhousie University presents an informal discussion on food security and it’s relationship to sustainability, community development and global health. Moderated by: Dr. Daniel Rainham, Dalhousie University, Elizabeth May Chair in Sustainability and Environmental Health. Drawing on in-depth interviews with individuals representing 35 non-government, public and private sector organizations in Nova Scotia, this report identifies some of the key issues, tensions, and opportunities for developing collaborative solutions around community food security in Nova Scotia. 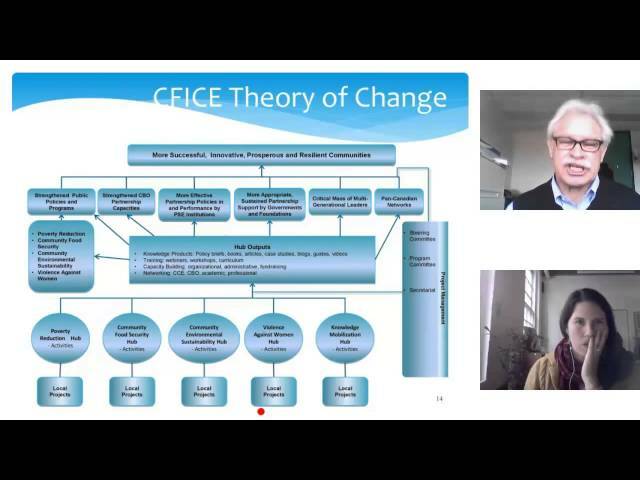 Based on the idea that solutions must be grounded in cross-sectoral alliances and shared interests, researchers with the ACT for CFS Policy Working Group reached out to farm organizations, fishermen, food bank representatives and government representatives from departments of agriculture, health and more in broad ranging interviews to understand the priorities of these various organizations around policy change. The interviews were analyzed with an eye to identifying strategic opportunities for moving forward on shared goals around a healthy, sustainable and just food system for all Nova Scotians. This webinar will share the initial results of the research and discuss the implications of the findings. Presenters will include representatives from various sectors (policy research, agriculture, food access, government). 1. Join us at a distance. Webinar access will be sent closer to the date. Please keep in mind that access to the webinar is limited and will be sent out on a first come first serve basis. 2. Join us in person, in Halifax, NS (Room/Location TBD). If you are planning to attend or if you have any questions, please RSVP with the method by which you would like to join to chantal_clement@carleton.ca or at 613.862.2588. The Nova Scotia Food Security Network and the Food Action Research Centre (FoodARC) released the research on the cost and affordability of a nutritious diet in Nova Scotia. Watch the video of the media launch of the 2012 Food Costing Report, featuring remarks by Dr. Ardra Cole, Dr. Patty Williams, Caralee McDaniel, and Dr. Gaynor Watson-Creed (1 hour, 9 minutes). The NS Food Gathering will bring together eaters, fishers, farmers, activists, researchers, health workers, anti-poverty advocates, civil servants, students, cooks, citizens, gardeners, and parents from across the province. A lot is happening around food in our province. Come to learn, share your ideas, have great conversations, and leave feeling connected and ready for even more action. The NS Food Gathering is a project of FoodARC and the Nova Scotia Food Security Network with participation from numerous food organizations across the province including Farmers’ Markets of Nova Scotia, Slow Food Nova Scotia, the Nova Scotia Food Policy Council, and the Food Action Committee of the Ecology Action Centre. To ensure your spot, go to http://nsfoodgathering2013.eventbee.com/. Bursaries for registration, travel, and accommodation are available to ensure everyone is welcome (limited availability on a first come, first served basis). Please don’t hesitate to apply. See Meaning partnered with FoodARC and offered techniques for identifying key ideas and highlighting content through lettering, titles, and information-organizing. This workshop was for those who wanted to use graphic recording in group work and for community-based and participatory research – to break free of flip charts and engage inner creativity! Join Food Action Research Centre (FoodARC) at our Open House showcasing participatory and community research to build food security in Nova Scotia. When: October 16th, 2013, 9:00 a.m. – 10:30 a.m. The Open House will give the Mount community and the public a chance to check out the work we do here at FoodARC. We will be featuring interactive exhibits, and research displays. We will have delicious local coffee from Just Us! on hand. Meet Dr. Patty Williams, the director of FoodARC, who will be giving remarks at 10:00am. Staff, students, and others engaged in pioneering security research will be mingling with guests to answer any questions you may have about FoodARC and food security research. at the Mount. Click here to view the full program for the full day event. As part of World Food Day on October 16th, join us for a screening of Occupy Love, a film that explores power and how our current systems are failing to provide us with health, happiness or meaning. In these times of hunger, growing poverty, and crises in our food systems, hear compelling stories of alternative systems of economics, sustainability, and empathy. The film will be followed by a discussion on food, globalization, and what we can do together to create change. Join Health Promotion Clearinghouse (HPC) and partners for an interactive conversation on food security, one of the key social determinants of health. This event will provide insight into some of the work being done on improving food security in Nova Scotia. It will also offer an opportunity to connect and network with others and to get more involved in the area. The case studies will range from the work being done by volunteers in community gardens, to organizations working on capacity building and changing policy. We will also be looking at access to affordable housing and its impact on food security, highlighting the inter‐connectivity of all social determinants of health. For more information and to get your ticket click here. Followed by a screening of the film Mama Milk: The Tatamagouche Breastfeeding Experience. Created by Kaia and Shaani Singh – two teenagers from the Tatamagouche community. Please contact Nadia (nadia.pabani@msvu.ca) or Brandon (brandon.gheller@msvu.ca) with questions. Join academics and community members from across Canada for a webinar on ethical issues in participatory action research (also known as community-based participatory research). Members of our FoodARC team, one of our community partners, and MSVU’s Research Ethics Coordinator will be discussing the ethical successes and challenges around our ACT for CFS project and participatory action research in general. Bio: Recently completed a two-year postdoctoral fellowship with Food Action Research Centre (FoodARC) in which she worked on the various components of the ACT for CFS project. Now that she has completed her fellowship, Irena continues to collaborate with ACT for CFS team and is involved with other FoodARC activities as a Research Associate. Topic: Irena will provide contextual background for the ACT for CFS ethics processes. Bio: Population Health Promoter working for Public Health Services in rural South West Nova Scotia. She has been working as the community liaison and contact for the ACT for CFS research project for the Eastern Shelburne County case community. Topic: Sheila will be speaking to the community perspective around the co-development of ethics procedures and tools with university researchers and learning/challenges around this process. Bio: Mount Saint Vincent University Graduate Student and Research Assistant with FoodARC. During the past 3 years, Felicia has done work on various projects based out of FoodARC, including ACT for CFS. Bio: Research Ethics Coordinator at Mount Saint Vincent University and part of the review committee for ACT for CFS ethics applications. Topic: Brenda will be providing her perspective as a university ethics coordinator. She will discuss ethical successes and concerns that have arisen for reviewers with respect to the ACT for CFS project, as well as with community-based research (CBR) in general. Presented by CFICE (Community First: Impacts of Community Engagement) and Food Secure Canada. See more at Food Secure Canada’s website. Activating Change Together for Community Food Security (ACT for CFS) project is a 5 year Community-University Research Alliance (CURA) based out of Food Action Research Centre (FoodARC) at Mount Saint Vincent University. The project utilizes participatory approaches in all aspects of research, including the development of ethics applications. Ethics applications are “proposals” that describe an intended research project and are reviewed by an independent panel to ensure the project will not be harmful or risky to participants. For ACT for CFS and related activities, ethics applications involved reviews by several panels representing universities, health authorities, school boards, and Aboriginal organizations. As this is participatory research, there are multiple tools that need to be developed – to assist community researchers in conducting ethical and rigorous research, and to assist university researchers in conducting work embedded in community. This has proven to be a messy and long process, but also one that has made ethics more meaningful to team members in community and academic settings alike. **It is not necessary to sign up for the webinar: Instructions for joining the webinar can be downloaded here. On Monday 27 February 2012 internationally renowned food activist Dr. Vandana Shiva presented to an appreciative full house. The session started with a framing of gender issues, followed by a half hour talk by Dr. Shiva, and then allowed for small group discussions. Dr. Patty Williams then gave a short presentation on food security in the Nova Scotia context. Followed by Dr. Shiva who addressed questions from earlier discussions. The event was organized by Oxfam, the Participatory Action Research and Training Centre on Community Food Security, and the Ecology Action Centre. Dr. Vandana Shiva attended The Valley Sustainability Showcase at the Wolfville Farmers Market from 2:30pm-4:30pm. This event bought together vendors from the Wolfville, Kentville and Windsor markets as well as a showcase supporting community resiliency and sustainable initiatives currently active in Nova Scotia. Local politicians, business persons and educational faculty from Acadia were present at this exhibition of the Annapolis Valley’s dynamism. This event was free and open to the public but donations were encouraged, to support Shiva’s Navdanya organization. Dr. Vandana Shiva attended a fundraising dinner at Tempest Restaurant. This dinner was open to the public and was a vegetarian 4 course meal with local wine. Host chef was Slow Food Nova Scotia leader Michael Howell. Dr. Vandana Shiva gave an address at Horton High School in Greenwich, NS entitled ‘The Future of our Food.’ This presentation was hosted by the Horton Environment Club. All proceeds support Navdanya and the Peoples Policy on Global Seed Sovereignty. Dr. Vandana Shiva was in Truro, NS, to give a brief talk at Seedy Saturday from 11-11:30am. The theme of the discussion will be on Seed Sovereignty. Dr. Vandana Shiva spoke from 1-3pm at the Nova Scotia Agricultural College auditorium, with an address on farming sustainably, sponsored by ACORN. Dr. Vandana Shiva gave a public lecture at 7pm at the Sharon United Church in Tatamagouche, NS. Theme: ‘Securing a Food Sovereign Future.’ Seating will be on a first come first serve basis. A Conversation with Dr. Vandana Shiva at Mount Allison University, Sackville, NB. 7pm-9pm. Dr. Vandana Shiva and Guests: A Feast of Conversation about Women, Men and Food. 9:00AM – 12:00PM (seating for 200, arrive early!) Mount St Vincent University, Multi-purpose Room, Rosaria Centre, Halifax, NS. Suggested minimum donation $10. Funds support the Navdanya organization. Dr. Vandana Shiva spoke at Dalhousie University (Ondaatje Hall, McCain building- 6134 University Ave Halifax, NS) to discuss her views on food security, water, land grabbing, women’s rights, the wisdom of small-scale farming, and seed sovereignty and more. All funds supporting the launch of the People’s Global Seed Sovereignty Project. The results of the 2010 Nova Scotia Participatory Food Costing Report were released at Mount Saint Vincent University, and the findings show that many Nova Scotians may be at risk for their health because they simply cannot afford to eat healthy. The 2010 Participatory Food Costing report suggests that families relying on minimum wage earnings or Income Assistance are at significant risk of experiencing food insecurity. According to the report, the average monthly cost of a basic nutritious diet for a family of four in Nova Scotia in June 2010 was $770.65, up almost 35% since 2002. Since 2009, there have been several positive policy changes; the province released its Poverty Reduction Strategy, which included an increase to minimum wage from $8.60/hr to $9.65/hr. And recently, the Nova Scotia government announced increases to Income Assistance personal allowance rates of $15 per month. However, the report suggests that a basic, nutritious diet is still simply out of reach for families living in low-income situations. It highlights the need for further review of wages, income supports, and social policy directed toward poverty reduction to ensure that all Nova Scotians have adequate resources to support their health and well-being. Researchers also stress that food insecurity is a provincial issue and one that affects the cost of health care in our province and our society as a whole. Participatory food costing was first conducted in Nova Scotia in 2002 with funding from Health Canada and has since been repeated in 2004/2005, 2007, 2008 and 2010 with funding support from the Nova Scotia Department of Health Promotion and Protection (now the Department of Health and Wellness). The Department has committed to fund ongoing participatory food costing to help to monitor income-related food insecurity and engage partners from diverse backgrounds to work together as a means of building food security in Nova Scotia. On April 12-14, 2011, four groups — the Nova Scotia Advisory Commission on AIDS , the Nova Scotia Participatory Food Costing Project, Activating Change Together for Community Food Security, and the Department of Health and Wellness’ Innovation Support Team — came together at Mount Saint Vincent University in Halifax, Nova Scotia to learn about Outcome Mapping. This three-day hands-on workshop introduced the group to the concepts of Outcome Mapping and offered participants the opportunity to apply it to their projects. Facilitated by Terry Smutylo, one of the pioneers of Outcome Mapping globally, everyone agreed that this workshop offered a practical, realistic, and exciting approach to evaluation that is meaningful in participatory projects, and when working towards social change. Outcome mapping is a new approach to planning international development work and measuring its results….The method focuses on measuring changes in the behaviour of the people with whom a [development] initiative works most closely. Outcome mapping limits its concern to those results – or “outcomes” – that fall strictly within the program’s sphere of influence. Oriented towards social change & organizational learning. Terry Smutylo created International Development and Research Centre’s (IDRC) Evaluation Unit in 1992, serving as its Director, until his retirement. He has since worked as a Special Advisor to IDRC, on the faculty of International Program for Development Evaluation Training (IPDET), as an outcome mapping facilitator, and as an independent evaluation consultant with international research and development organizations. He specializes in methods that empower stakeholders, promote learning, and focus on outcomes in project, program, and strategic evaluations. While with IDRC, he led teams that developed several internationally recognized methodologies, including organizational self-assessment and outcome mapping. He has conducted evaluations, provided training, and facilitated organizational development for development organizations in Canada, the United States, Europe, Asia, Africa, and Latin America. Sarah Earl, Fred Cardon, and Terry Smutylo (2001). International Development Research Centre, Ottawa.This is an excellent and accessible resources, providing an overview of Outcome Mapping in a step-by-step fashion, along with a facilitation guide for you to use with your project. This online community includes discussion forums, many free downloadable resources, and the opportunity to connect with others using Outcome Mapping around the world. You can also subscribe and post any of your work / work-in-progress as a shared resource. Our thanks to Terry Smutylo, Jeff Harper, Katrina Ross, Satya Ramen, Mount Saint Vincent University, the four organizations, all the participants of the workshop, and the NS Department of Economic and Rural Development and Tourism for financial support. To kick off a five year research project to Activate Policy Change for Community Food Security a gathering was held over three days at Windhorse Farm in New Germany, Nova Scotia. Build a shared ownership; and•Network and build relationships. We took a participatory leadership approach to working together. It is a systems thinking approach to leadership, where the entire group works together to set an agenda. Communication is driven by asking questions and working as a group to find answers, actions and solutions. The emphasis is not only on what we want to change, but offers us the chance to transform how we work together, improving our results. This video highlights key decisions, conversations and the outcomes of the three day gathering. 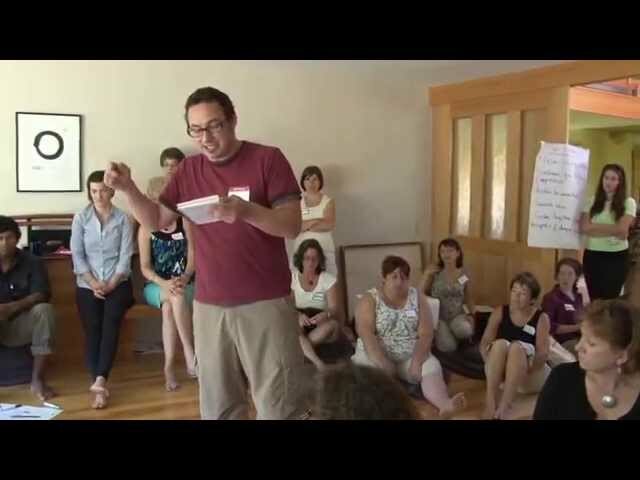 Tim Merry, a change leader, spoken word poet, and host for the event, spontaneously captured the group’s collectively developed vision of community food security.